The Energy Directive (RED 2) transport decarbonisation ambitions ostensibly promote major capital investment in truly advanced biofuels breakthrough technologies. However, the Directive will not generate meaningful advanced biofuels investment. Instead, it incentivises fake wastes to meet biofuels targets for 2030. This is clear from what has happened with 2020 biofuels targets. The European Commission made this possible by quietly greenwashing feed and food products as advanced biofuels. Today, almost all EU “advanced biofuel” comes from these fake wastes, including starch, feed grade palm oil, imported used cooking oil (UCO), and even bread. French interests have even tried to get molasses classified as a waste. Non-feed products with important chemical markets, like tall oil, are also given waste status. The Waste Framework Directive defines waste as discarded material, that means dumped. However, each of the above materials has an alternative economic use. By effectively classifying these materials as waste, the Commission has opened the door to fraud, a door through which dubious imports are flooding into the EU. Many imported feedstocks have higher levels of ILUC than domestic EU crops for biofuels. And here, in an Orwellian twist, the “ILUC Directive” is, in practice, about shifting Europe’s biofuel mix from low-ILUC to high-ILUC biofuels. 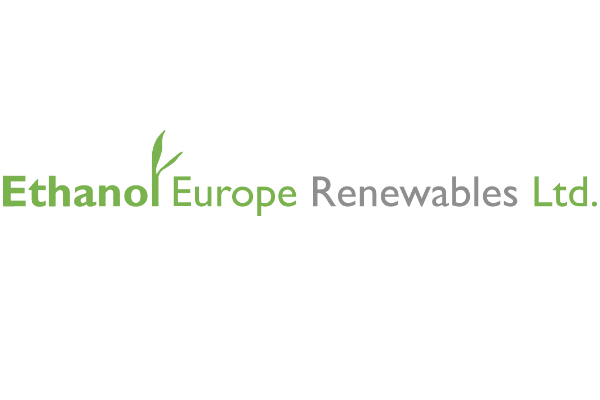 The potential for fraud in advanced biofuels is a major concern of the European Court of Auditors which has accused the Commission of facilitating fraud in the industry. The Court found that EU certification schemes do not provide sufficient evidence of the origin of wastes and residues used in biofuels. It gave examples of fraud risk including that “the operator could classify as waste or residues something that it is not (or was adulterated)”. A major incentive for fraud is double counting which increases the monetary value of fake wastes. For instance, a litre of double counted used palm oil imported from the US (where it is an animal feed) and a litre of fossil diesel are counted as two litres of biofuel. Fuel suppliers have a clear reason to pay more for a biofuel that allows more use of fossil oil than for a biofuel that takes oil off the market. The premium for double counted biofuel is in turn reflected in better prices for waste feedstock. This explains why used cooking oil often costs more than unused cooking oil, especially in the United Kingdom and why there is such a strong surge in imports. For instance, only 23% of the UCO for biodiesel in the UK comes from the UK with UCO from non-EU countries comprises 41% of the total used. Exports of Chinese UCO and UCO based biodiesel to the EU increased five-fold to over 200,000 tons in 2017. The Court linked incentives for fraud to double counting and noted that “it cannot be excluded that data on double counted biofuels might include quantities of biodiesel certified as produced from UCO, whilst, in reality, the feedstock may have been from virgin oil or fraudulently denatured virgin oil”. Despite this, the Council is proposing to continue double counting for waste in the RED 2. 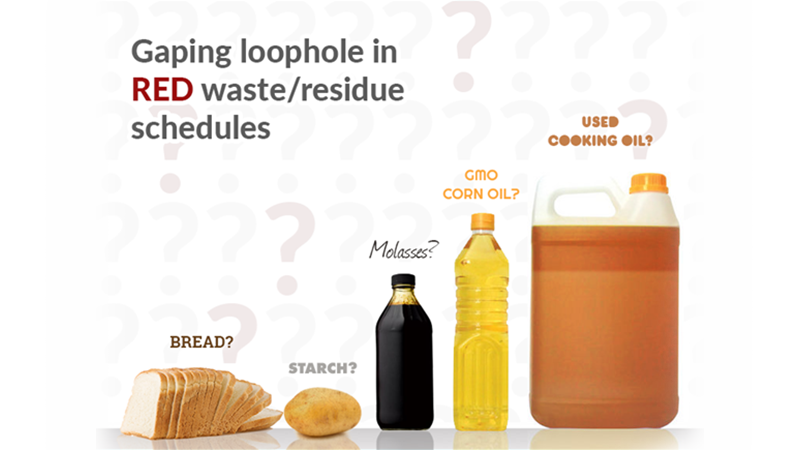 Traditional biofuel feedstocks (like feed wheat and unrefined rapeseed oil) that are not actually human food are labelled “food-based biofuels” by the Commission, while it confers a special category on fake wastes. Many of these “wastes” are imported from developing countries and displace feed based biofuels from crops grown by EU farmers. The interests of EU farmers and of sustainable conventional biofuel producers are more than offset by large sophisticated multinational sugar companies, importers, traders and starch companies who have deep influence within the Commission. To take one example, the EU starch industry claims it has a “zero waste objective” and that it has waste of less than 1%. This amounts to 100,000 tons of waste of all types at the industry’s annual output level of about 10 million tons of starch. Yet just two starch companies, with plants in France, Belgium, Poland and Germany, produce almost three times as much biofuels from “waste” starch slurry than would be possible from 100,000 tons of pure starch. This gap is unexplained. In the Netherlands and the UK, for instance, a ton of gasoline is mixed with a ton of ethanol made from this food/feed starch, and oil companies write down that they’ve used two tons of biofuels. Farmers and the climate have been jilted. Another Court indictment of the Commission’s waste regulation was that it enables different standards to apply in different member states. Waste in one country is not waste in the neighbouring state. The ILUC Directive allows a member state to classify as waste any materials that were listed as a waste before the ILUC Directive entered into force. The French beet ethanol industry used this to classify molasses as waste in France, though without double counting. Finns did it with waste bread. Today a substantial proportion of French ethanol is produced from molasses, a food. The French industry lobbied to get molasses approved as a waste in RED 2. The Parliament challenged this (and palm oil, and tall oil) in amendments. In the trialogue the Parliament’s position must become law. Giving preferences to starch slurry and other double counted feedstocks when they are valuable food, feed of chemical products is just wrong. Doing so calls into question the integrity of the Commission and makes it untenable for the Council to propose double counting. Policy should only contain a separate mandate for truly sustainable advanced biofuels based on breakthrough technologies, and a separate mandate for sustainable conventional biofuels. The Commission has proven that it cannot manage a policy that is not simple and clear. In circumstances where the Commission is failing spectacularly in regulating its own standards, the trend of increasing fraud is disappointing, but no longer surprising.